Last night, we took Adam, Heather, Adam's dad Kent and stepmom Linda to the show, "Smoke on the Mountain. 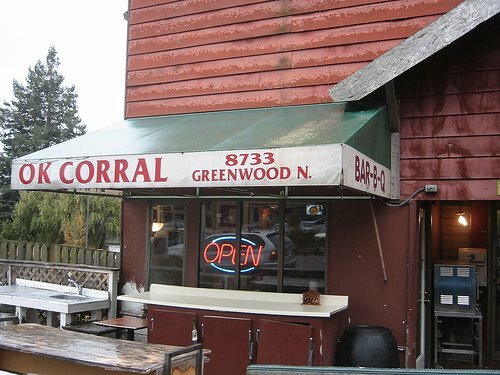 Before the show, we headed down to OK Corral BBQ. We'd never been but had heard good things. Taproot had them cater an event one time but neither of us were there. So, we show up at this place which is absolutely nothing to look at. The tables out front (outside) are a conglomeration of found objects. The owner is Otis Austin, a big ol' teddy bear of a guy from Georgia. He's quite an interesting character. After Heather told him we were running late and going to the theatre, he treated us right. First, they brought out the "hood juice" in jars. It's the only drink they serve. It's toxic waste green and tastes a bit like Kool-Aid but the flavor escapes me. Something tells me you wouldn't want to know. After that, a roll of paper towels appeared on the table and then heaping helpings of bbq chicken and pork ribs. Wow! Messy but oh so tasty. Some sides appeared: collard greens, black eyed peas, and hushpuppies. Didn't try the greens...not my thing. I'm not a big fan of black eyed peas but these were quite good. And the hushpuppies tasted like my dad's and that is high praise indeed. Some catfish appeared and were quite good although my dad's fried fish are much better. Otis told us the catfish come from Mobile, AL...near my neck of the woods. During dinner, we find out a few things about Otis...he was in the service, he used to box and he's from Georgia. I believe I'll eat there again just to find out some more about this guy. After gorging ourselves, we waddled down the street to the theatre for "Smoke in the Mountain." A production set in a 1938 church in NC. The new pastor is trying something new by bringing in the Sanders Family Singers. What ensues is a night of bluegrass tinged gospel, hilarious hijinks, and just a big of redemption. It's a fun show. So, our smokin' evening ended. We waddled home and put our bbq-breathed selves to bed. It's nice to have discovered some original southern cooking here in Seattle because for the most part, these NW folks wouldn't know good southern food if it fell on their heads. Now, if I could find somewhere to get grits. they just opened smoke at artisan center theatre in hurst (for the third in its four year history, plus a stint of sanders family christmas in 04) because it sells like gangbusters. For some reason, Seattlites are rabid for southern tinged things. I don't understand it. They think it's quaint. Sometimes it's a bit annoying. It's as if they are patting us on the head and saying, "Bless your hearts." This show brings out the faithful...the old diehards craving an evening of old gospel music. You should hear them singing. It's pretty amazing.